Need More Michael Jackson? Love "Billie Jean"? This Site Is Awesome. The web is still inundated with Michael Jackson news, but just in case you haven’t had your fill, I highly recommend the site Billie Tweets. 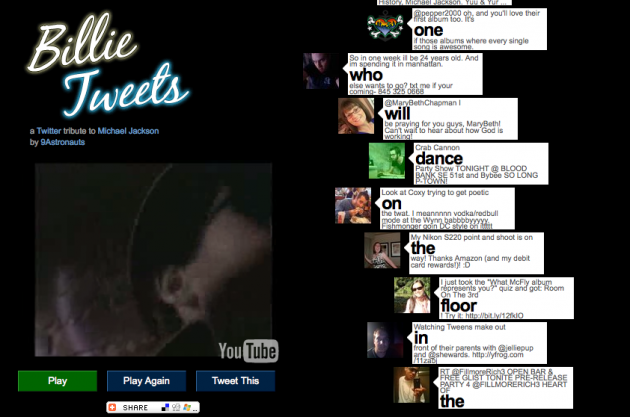 The concept is simple: Take Michael Jackson’s “Billie Jean” and pull in tweets that sync words to the music. The site was made by 9Astronauts, the development house that also made the Blame Drew’s Cancer site a few weeks back. Another solid creation by them. Considering that Jackson’s music is utterly dominating all of the online sales charts right now, this site is also a smart play to pull in some affiliate fees for sales from Amazon. You’ll notice the links at the bottom of the site.